I am looking for someone to design me a logo. This can be just text - etayvisuals in lower or uppercase. 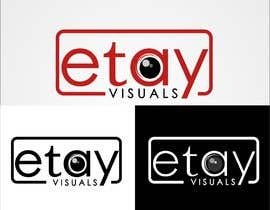 or etay visuals or with any logo you can think of / the images i have uploaded for inspiration. Would like the text to be placed with etay on top and visuals underneath. FONTS - BEBAS NEUE, Calibri, Avenir Next or handwriting (not fancy, more doodles) or whatever you think would look simple/minimal/modern! This will mainly be used for a business card / my social media, so excited to see any entries! This will be mainly for TV / Film / Production / Photography, so any designs related to that are welcome. I would love it to look fresh, clean and exciting. Don't want it to be too distracting though. Open to any colours / similar fonts to those I have used already or some you think might look better. I have uploaded some pictures to take inspiration from / what I have already. I look forward to seeing your entries! I don't know if this makes any sense but really want the perfect logo for my business/freelance jobs to put on my website/business cards etc. Thank you! Any change Please feedback Me . I will be picking a winner in 5 hours, so any more last minute entries/changes are welcome! Thank you every one who has entered the contest. Nice day please check my revision entry , any change feedback me. Thank you everyone for the entries, they have turned out amazing! I will be picking a winner this weekend. Any more entries are welcome, and any creative ideas/new concepts would be awesome. Please do not copy each others work! Thank you for all the entries so far, they are looking amazing! Sorry for rejecting any, I just want to make it clear what ones I like the best so I am able to pick the winner. PLEASE READ **** When uploading please keep minimal, creative design and I would like the picture to be PNG, JPEG, not with a block colour in the background. So that I am able to overlay this logo onto anything. Thanks very much and I like all the entries so far! I love your entry! Please enter more if you are up for it. I'm looking for a more minimal simplistic design either with lots of colour or just black/white/red or whatever you think looks better. I really like the T letter you made though! Sir, Please check it #17, #18 and #19 that fulfill your choices. If need any changes please tell me. hello is this for tv channel ?